olive green. Can anyone but us Indians, conceive such surprising yet glorious combinations!” Nidhi Jain had remarked at my handwoven Tussar the first time I met her three years back. Nibbling at the tantalising lemon cheese cake sitting before us, I immediately stopped, looked up at her and smiled. “I am glad you think this works because somehow my mother doesn’t. She’s from the old school where saris needed to be matched with blouses. But I love contrasts. It’s how traditional weaves can get that contemporary spin. 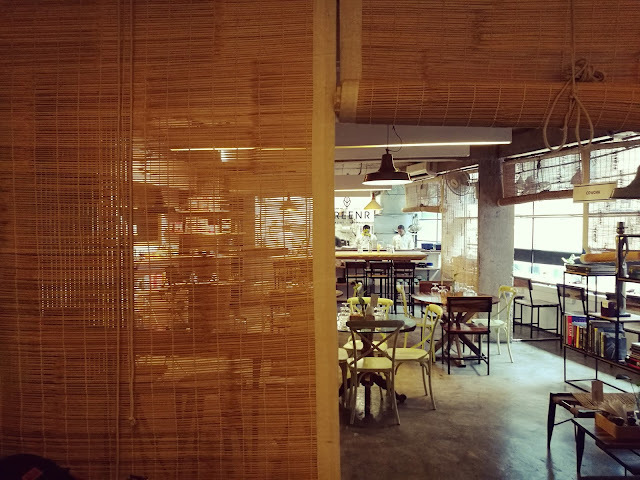 I’m going back to tell my Ma what you said,” we hit it off instantly over our love for handloom, textiles and a delish cheese cake on a balmy winter afternoon in a quaint café in the south of the capital. The other day as I readied for a concept shoot with her we just picked up from where we left during out last session. The world of vintage textiles, luxury weaves, the beauty of the fabric and the modern techniques that she’s incorporating into the traditional methods. For the shoot, I zeroed in on an exquisite light pink Bomkai from Odisha that flaunted the complex structure of the Ikat procedure. Contrasted with the signature Chakra design in black for the border and pallu, Nidhi showed me the trimmings that made the sari stand out even more. A broad patch of fabric with Warli prints near the pallu end, a bright yellow back-border made the sari fall so much better. 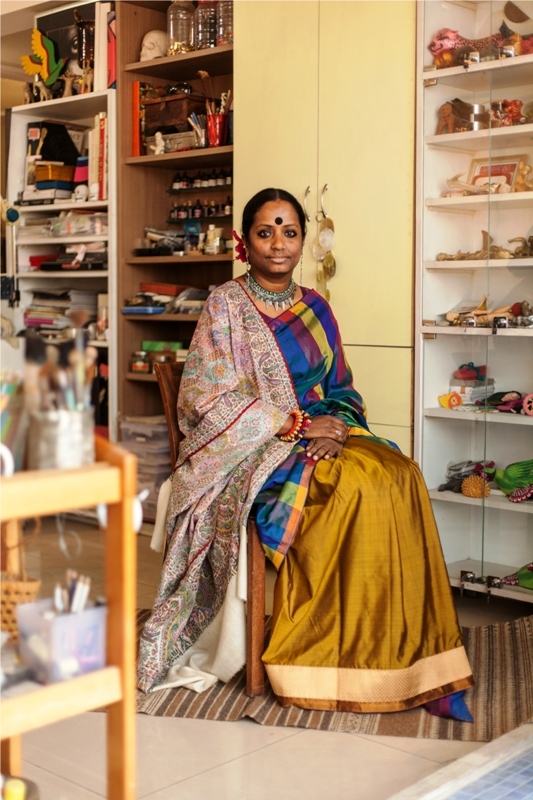 Interestingly, when Nidhi launched her first fashion studio and label, Hues, after passing out from NIFT in 1994, it wasn’t about the traditional six yards that she today is known for designing. It was a studio that housed western wear for the fashionable lady. However, true to her love for handlooms and handwoven textiles, the western wear was crafted out of only handloom material. 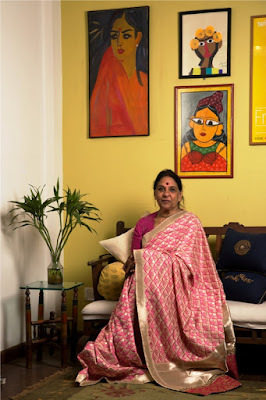 “Though Hues was a success, it did not take long for me to realize that my true calling was handloom saris and I started working with them,” says the textile designer who is an emissary of handloom and handwoven saris from several parts of India. imbued early. 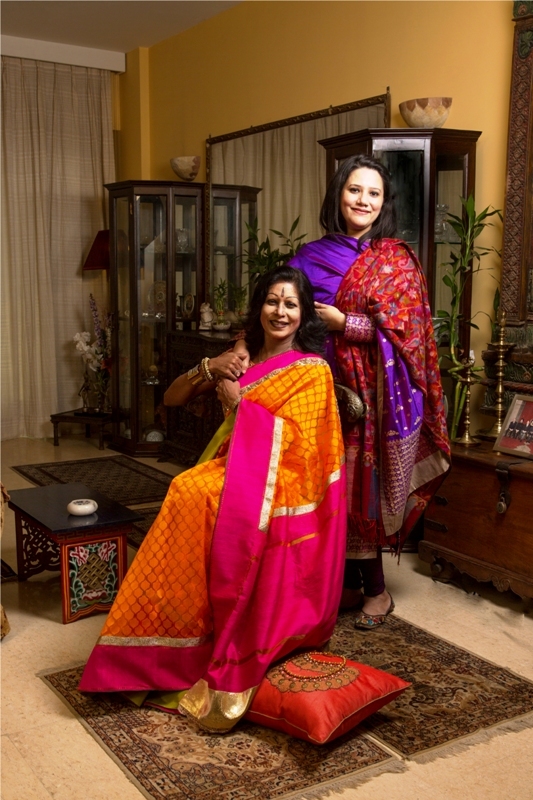 Traditional weaves and handloom fabrics became a part of our lifestyle. I wore phulkari and kalamkari dupattas. Words like ikat and pochampally were regular in our fashion vocabulary. 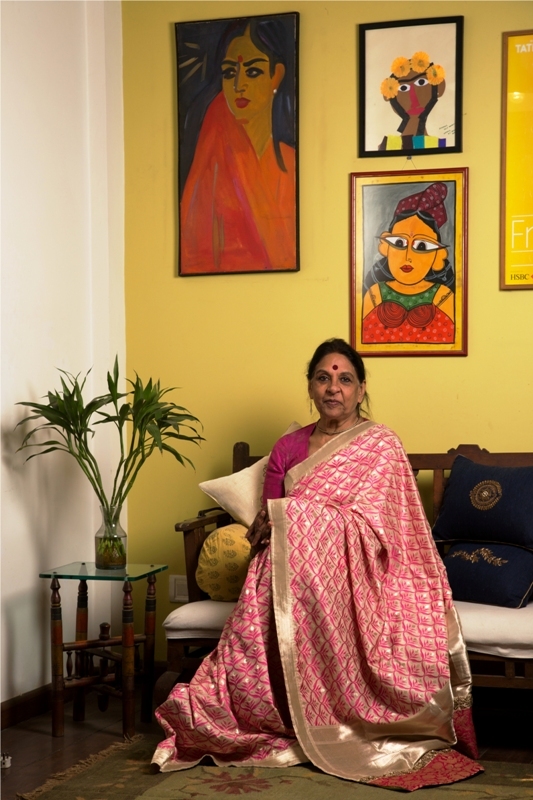 After I got married to Rajnish, I gravitated to handloom saris and decided I wanted to concentrate in working with them as there is nothing special than the heritage weaves of India,” says Nidhi. 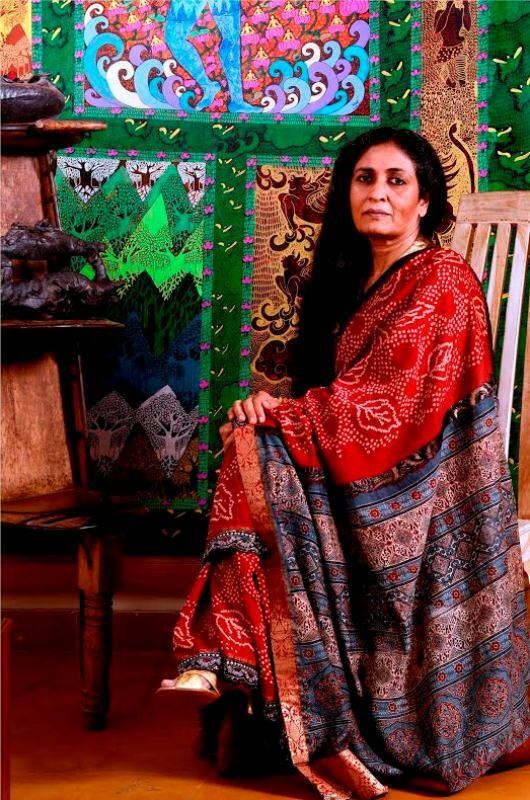 For the last 18 years she has been travelling to the interiors of Kutch, Bhuj, central and south India to delve into the art of the weavers, suggesting patterns and motifs to modernise the vocabulary of the weave designers. Nidhi is involved in restoring and recreating real zardozi embroidery in silver. “These restored zardozi embroidery are then dexterously used on handloom fabric. This is the special point of our bridal wear. We also work on how beautifully an ethnic weave can be teamed with an embroidered velvet shawl. For me it’s all about the amalgamation of different traditional weaves and fabrics. You can wear an upada sari with a banarasi blouse embroidered with a Rajasthani gota border,” says the designer. Narayan, artists Mithu Sen and Seema Kohli, diplomats Jaya Jaitley and Vaani Tripathi.